What are the Best School Playground Design Ideas? | What are the Best School Playground Design Ideas? What are the Best School Playground Design Ideas? Without previous experience, designing a school playground can seem daunting or difficult. After all, every school wants its recreational equipment to be loved by the children, whilst simultaneously helping them grow and develop. Children love to explore and try new things, which is why playground equipment which lets them climb, slide, rock, spin, swing and balance will be a sure-fire hit! Here at Kompan, we recognise that the most important aspect of a playground is the children who will be using it. Their enjoyment and growth are all that matters, which is why we have spent years perfecting our range of playground equipment and are always happy to advise customers on the best choices for them. However, if you’re still weighing up your options, there’s no need to worry. We have compiled some of our best school playground ideas to spark some inspiration and help you make a decision. Simply look for your school setting below and take a few notes! Above all else, playground equipment must be age and school appropriate. This is essential for ensuring safe, enjoyable play that is beneficial for the children in your care. In an EYFS setting, play remains both a way of exerting energy and a method of discovery for the children. To this end, EYFS playground equipment must be imaginative, colourful and eye-catching whilst permitting freedom and encouraging physical challenges. Here are three distinct themes that will help you create a Kompan playground perfect for your setting. Classic, proven and universally loved, traditional playground equipment is a firm favourite around the world. Primarily made up of common equipment like seesaws, slides, sandpits and rocking apparatus, traditional play hubs encourage social interaction whilst leading to gentle physical exertion. Considering just how popular traditional play is, you simply can’t go wrong with this theme! Young children and toddlers have a wonderful imagination and the best school playground ideas should encourage this. 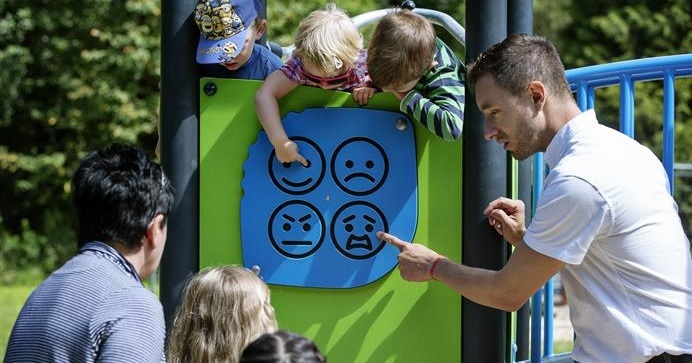 Through the use of themed play equipment, it’s easy to encourage children to create their own worlds, building stories and challenging their creativity whilst socialising with others. Specialised playground apparatus like train carriages, workstations, labyrinths and play counters all drive discovery and growth through individual moving parts and group play. Imaginative play is a great way to boost cognitive development through fun and engaging experiences. Children are innately curious, which is often what draws them to animals. Other living beings are fascinating for a young mind, which is why much of our equipment combines animal themes with bright colours, eye-catching imagery and physically demanding play. Consider combining a forest themed multi-play structure with simple apparatus like our zebra seesaw and little elephant rockers. This type of theme draws attention and immediately entices the children in your care, which is exactly what you want. In primary school, children begin to view the world with more understanding and the need for imaginative play is lessened but still present. Instead, healthy competition, group play and physical growth are the main focuses of primary school playgrounds. Create an iconic, rustic and natural look with our Organic Robinia Wood range of themed, traditional and contemporary playground equipment. The Robinia Wood apparatus is perfect for encouraging discovery and contact with natural materials, whilst remaining versatile and varied enough to help make your school playground unique and exciting. In a primary school setting, combine multi-play structures with agility trails to build speed and balance tests whilst encouraging social interaction and group experiences. Robinia Wood is firmly cementing itself as a classic playground equipment choice; you can trust that it’s effective. Another incredible way of building a competitive, safe and energetic playground environment is through combining climbing equipment into an all-encompassing physical exertion experience. An accessible and easy starter option is our exclusive BLOQX™ range, giving your playground an enticing urban style and appearance. For extra challenge whilst maintaining the street theme, add our award-winning GALAXY™ line of multi-play structures. Complete the system with some rigid climbing nets and you have a tailor-made solution for all physical abilities. If you’re looking to focus on group play above all else, then the group play hub theme pulls aspects of all the other groups into a single, socially focused unit. By combining multi-play structures, agility courses, shelters and climbing equipment, it’s easy to bring students together and create group play scenarios. This has a very positive impact on empathy and emotional growth, whilst simultaneously testing physical abilities. By secondary school, most young people have outgrown conventional physical play and benefit much greater from organised team play, sports and fitness. Fortunately, here at Kompan, we have developed exceptional equipment purpose-built with this goal in mind. Turn your playground into a simple outdoor gym, encouraging students to develop their strength in their own time. For more organised fitness playground equipment, consider circuit training apparatus, cross-training structures and callisthenics equipment to permit safe working out with or without supervision. It’s easy to make your secondary school playground an extension of your physical education equipment through this theme. The Multi-Use Games Area (MUGA) offers the best way to turn your playground area into a school resource. Through the combination of our durable, modular panels and equipment, it’s possible to create a bespoke playground solution tailored to your space and your needs. Through the Multi-Use Games Area, you can create a multi-functional, contained and safe sports area for your students to enjoy, without going past your budget. This is a great option for secondary schools wanting practicality from their playground, as well as student enjoyment. A distinct upgrade in difficulty from our primary school agility courses, obstacle courses are an excellent way to custom-build a challenging physical test for your students. This form of structured physical exertion is useful during physical education classes and encourages healthy student competition during break periods. This is a versatile and modular theme that can easily be adapted to your space and budget. Having covered each age group, there are still a few key points to mention. Children of all ages play in different ways. There are plenty of young minds that love active play and growth, but there are others that enjoy social interaction and less active play too. Remember that social equipment and meeting points are just as important as the play structures themselves. Supervising children during play is a vital aspect of ensuring safety. Investing in benches, chairs and other park equipment is perfect for teachers and staff who will be supervising the children during play. To conclude, these are just a few of the potential play themes and best school playground ideas that you could opt for in your educational setting. If you would like more detailed, personalised or focused advice, please don’t hesitate to get in touch with us - we would be happy to help.